Presented at AEHRF side event of the 32nd Session of Human Rights Council, UN, Geneva - 23.06.2016. Ethiopia, under the ruling EPRDF, which has held power for the last 25 years, is in a deep political and socio-economic crisis, with the people protesting their dismal conditions throughout the country day in day out and facing barbaric attacks. The regime knows no rational and peaceful means to resolve the plight of the people, but only resort to brute force to silence legitimate dissent. It adamantly quells all the numerous nation-wide peaceful protests with street assassination, arbitrary arrest, torture, mysterious disappearances and mass killings. Such barbaric tactics, evidently, are leading to uncontrollable violent conflicts reminiscent of the on-going Oromo uprising in southern Ethiopia where 400 peaceful demonstrators were massacred and thousands injured and incarcerated from November 2015 to May 2016, according to Human Rights Watch, whose report was presented at the current 32nd Session of Human Rights Council. - Ordinary Ethiopians in their tens of thousands are languishing in secret prisons, facing mind-boggling torture, atrocities ranging from cold-blooded beating to mass killing are taking place whenever people stage protest rallies, assassinations are committed across the country against individuals with dissenting ideas, families not only are not informed the whereabouts of their disappearing loved ones, but also are threatened with similar sanctions if they dare inquire. - Opposition political leaders, critical journalists, human rights activists and civil society advocates are incarcerated and are charged with “treason” simply for adapting dissenting ideas. All such charges are politically motivated especially in the aftermath of the 15 May 2005 election when the vast majority of the people openly demonstrated their rejection of the vindictive regime in power. The charges of terrorism concocted against Journalists like Eskinder Nega, intellectuals like Abraha Desta or activists like Temesgen Desalegn and the kidnapping of opposition leaders like Andargachew Tsegie from Aden, Yemen are cases in point. * Street assassinations: again I name just two of many, that of Assefa Maru, a human rights activist in 1994 and Aregawi Wolde Yohanes, a parliamentary candidate for the opposition party Arena Tigray in 2010; they were assassinated in Addis Ababa and Shire respectively, both in front of their families in broad day light; by so doing also to install fear in the populace and other opposition elements. * In Gambella / southwest Ethiopia 424 peaceful Anuaks were massacred on 13 December 2003, (for details please refer to reports of Anuak Justice Council by Ato Obang Metho. * In Addis Ababa, the capital city of Ethiopia, in the wake of the 2005 election, 193 peaceful demonstrators were killed and hundreds were wounded in one rally, simply because they protested against the irregularities of the election. For details on this particular tragic event and other violations of Human rights please refer to EHRCO annual reports. * At present (in 2016), Oromo and Ogadene ethnic Ethiopians are facing murderous assault for simply demonstrating against injustice enacted on them. As indicted earlier, the current violations of people’s rights and the attendant cruel responses, in their worst forms, have been going on since 2015. The list of the inhuman crimes of the regime goes on and on. All the punitive steps, one should notice, are not incidental by any means but systematical designed tactics to be pursued against any type of dissent. Since it seized power in 1991, the response of the EPRDF government has been marked by outright killings of people who stood up for their natural rights. The vicious design was crafted to curb peaceful and legitimate opposition any time anywhere in the country. The above cited limited violations of human rights and flagrant crimes are, indeed, not incidents but the regime’s well planned measures of coercion to enforce submission and they constitute a pattern we witnessed over the last 25 years. These measures were and are still manifested throughout the country, as effective means of repressing if not eliminating legitimate challengers and dissenting voices. - This pattern of the repressive conduct of the ruling EPRDF which has been growing aggressive ever since it seized power has its roots in the nature of the organization. Basically, it was inherent in the totalitarian ideology which the late dictator Meles Zenawi, established as “revolutionary democracy”, having nothing to do with revolution or democracy. The genesis of this ideology goes back to July 1985 when Meles Zenawi publicly formed his party, the Marxist Leninist League of Tigrai (MLLT). Now, Meles Zenawi is gone for good, but the party he begot and the evil inspiration he installed in his disciples are still the informal backbone of the current government. - The sheer despotism that emanated from the twisted ideology in which the EPRDF has been absorbed in is best illustrated in the shame elections it conducts every five years. If we may catch a glimpse of the last two so-called parliamentary elections, the 2010 was won by 99.6% and the 2015 by 100% in favor of the ruling EPRDF, leaving not even one seat for the opposition parties as in the latter case. This is nothing but a mockery of the doctrine of elections in general and a disdain of the Ethiopian people in particular. Still, the ruling EPRDF was not contented with the outcome of the rigged elections, for it could not depend upon fictional votes. Henceforth, it has to devise other treacherous methods to eliminate its political opponents, civil society groups, democratic elements and human rights activists. It enacted series of draconian laws which are meant to sustain the life span of the one party rule and repress any type of dissent. Some of the vicious laws are: a) Mass Media and Freedom of Information Proclamation, 2009, b) Anti-Terrorism Proclamation 2009, c) Charities and Societies Proclamation. The undeclared purpose of these Proclamations are to muffle freedom of expression, to dismantle private press, to cripple political opponents and freedom activists by labeling them “terrorists”, and to bar international human rights agencies from disposing their support to the emerging civil society. Adding insult to injury, one could also observe regional as well as international forces conniving with the tyrants in Ethiopia. For instance, Joseph Chelingi, an AU - ECOSOCC official was on record in the 32nd Human Rights Council session side event, completely denying the prevalent violation of human rights in Ethiopia and shamelessly reiterating the shabby pretext of the dictators. More so, European powers including the US and the EU are in the for-front supporting the ruthless EPRDF regime in every conceivable way including militarily, financially and diplomatically, there by sustaining and legitimizing a diabolic regime at the cost of the rights of the Ethiopian people. The logic behind this unethical and short-sighted collaboration, as often told, is to fight international terrorism. Unfortunately, the payback of this misguided policy turns out to be the breeding turf of terrorists and the upsurge of all round crisis in which the ultimate victims are human and democratic rights of entire people. 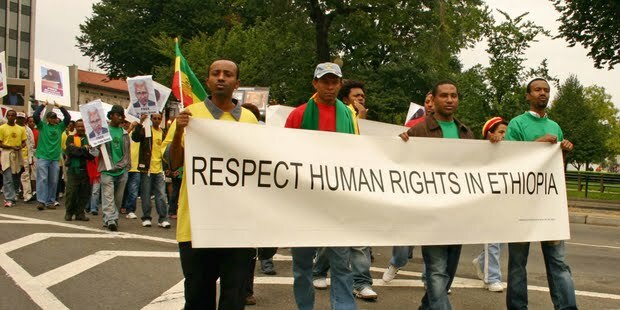 In a nutshell, Ethiopia, at this time, is ruled by a ruthless and deceptive regime that doesn’t have any regard to the human or democratic rights of the people it claims to respect, or to the plea of international human rights organizations. This situation, unless reversed on time, will lead to a dangerous anarchy which may put the region at large and the nation itself at a risk of atrocious civil war that may culminate in a stateless society. What is the way out of this impasse? The point at stake is whether the Ethiopian dictators in power who persistently rig elections, who shower bullets on peaceful demonstrators and who have impoverished the whole nation, should be rewarded or held accountable for the atrocities they committed? To put it conversely, should the people who rejected dictatorship and opted for democratic and peaceful transition be supported or punished? This is explicitly a choice of principle and justice on the one hand, opportunism and bigotry on the other. If the powerful states are up to the moral laws they claim to adhere, they could stand on the side of the people and play a positive role in the interest of humanity, mutual advancement and lasting peace in Ethiopia and beyond. The ultimate breakthrough to the impasse our people are entangled in, of course, lies in the power of the people itself, but if only consciously organized to uphold their rights and defend their basic interests. Self-empowerment of civil society that has the power to check the coercive realm of the state is the key to the endless predicaments of our people. Not long ago, the people of Tunisia, Egypt and Yemen stood up in a peaceful uprisings, dubbed as the Arab Spring, and unseated longstanding dictators in their respective countries. Although short of instituting people based accountable states, the experience of the struggle thus far, however, highlights the extent to what the power of an organized and united people could go. Obviously, organized people can bring about formidable changes to the benefit of the entire population. The envisaged change is, therefore, the establishment of people based participatory democratic state in which integral respect of human rights is the cornerstone upon which state and societies interact and strive in harmony.